These recordings were made for Sony between 1993 and 1995. Biddulph’s currently fitful production is no longer focused on recordings of the truly distant past but even so this still seems a curious restoration for them, even though the disc has real pedigree: Jon Samuels was the original mastering engineer and the executive producer of the restoration, who also writes the notes, is long-standing Biddulph supremo, Eric Wen. 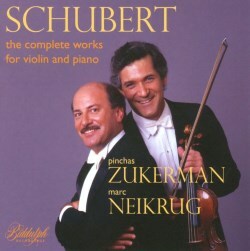 You wouldn’t expect anything less than aristocratic poise, rich romantic tone, unabashed lyricism and sheer class from the Zukerman-Neikrug duo. Their tempi in the Schubert Sonatas, or Sonatinas depending on one’s preferences in nomenclature, tend to be on the easy-going side, allowing phrases to breathe. If one happens to find that Zukerman’s interpretation of Schubertian Allegro molto comes perilously close to Allegro moderato, then compensation arrives in the form of phrasal sophistication and suave elegance in D.384’s slow movement. Finales have grace, even if they’re not exactly aerial in impulse, and slow movements reveal Neikrug’s nobly balanced statements, without undue over-inflation. So these sonorously Old School performances of the Sonatas will please the duo’s many admirers: for rich, warm gemütlich Schubert look no further. For other, different qualities from older players, search out Grumiaux’s agility and Goldberg’s style. The larger challenges of the Duo Sonata and, especially, the great but interpretatively difficult Fantasy are excellently met. Zukerman’s portamenti in the former carry more than a whiff of romantic pathos – and there is much articulate and well-articulated playing throughout from both men with an appropriate, and not excessive level of expressivity in the Andantino. Rhythms in the Fantasy’s Allegretto are strong and sinewy, the playing as a whole masculine and robust, if not always as introspective as some might wish. In her recent Chandos recording Tasmin Little, for instance, was significantly more leisurely and elastic than Zukerman. Zukerman always had another string to his bow and it’s called the viola. His performance of the Arpeggione Sonata is exemplary in richness and roundness and a fine example of his elevated status as a violist. So, these refreshing, warm-hearted and unabashed recordings hold their place through sheer vibrant sophistication.